Custom 5x 4 inch oval outdoor safe full color magnet makes a good promotional token for marketers who wish to spare themselves from big investments and save money for building business. A logo imprinted promotional 5x 4 inch oval outdoor safe magnet can be best utilized for promotions- by advertisers who are starting out new in the niche, by social services and individual businesses. 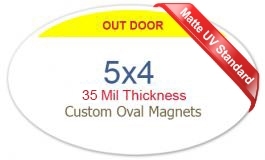 So a personalized 5x4 inch oval outdoor safe full color magnet may not be crowd puller, but marketers can creatively utilize it to draw attention from closer quarters. An oval shape advertising canvas is always considered elite because it offers lots of creative space for advertisers to work. Product Size : 5 in. x 4 in.